Stigma is the attitude that someone is unacceptable because of a difference. 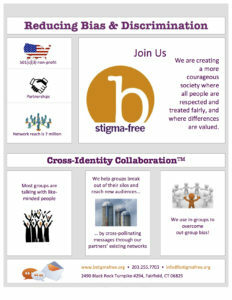 B Stigma-Free is a national 501(c)(3) non-profit organization committed to creating a more courageous society where all people are respected and treated fairly, and where differences are valued. We bring together divergent groups and use storytelling to educate and engage the community to reduce bias and prejudice. Typically efforts like these channel messages to like-minded people. We’re using Cross-Identity Collaboration™ and breaking out of the silos to help people overcome their fears and increase understanding of differences. We are organizing collaborations across identities on both a national and local, grassroots level. These collaborations (Partnerships nationally, and Coalitions locally) facilitate a method for brand (identity) messaging to reach new audiences through cross-pollination, using in-groups to convey the message, overcoming out-group bias. Join our new social movement, and help us tackle the polarization in our communities and across the country with this innovative method of community engagement, exposing and reducing stigma in our society. 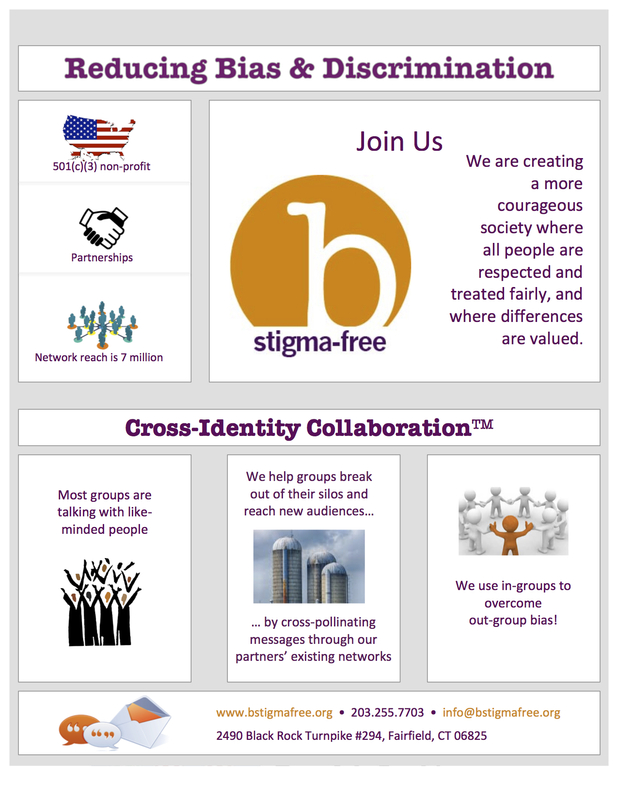 B Stigma-Free is a national non-profit 501(c)(3) organization that helps create a kinder society so people with differences are accepted, respected and included for who they are. Through Cross-Identity Collaboration™ we partner with our stakeholders to educate and engage the community to reduce bias and prejudice. A society where all people are respected, and where people can feel safe and included just b’ing themselves.